Finding enough secure storage space for expensive chemicals, materials and equipment in the classroom is always difficult. 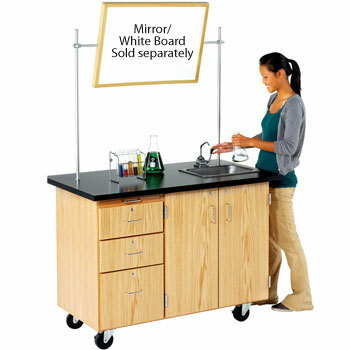 This science table pulls double duty. Spacious interiors with locking cabinets and drawers give you the storage you need, and chemically resistant tops and wood finishes allow you to use them in everyday classroom use as well. All drawers and doors have locks. This unit features a 1-1/4" chemical resistant ChemGuard top, Unit has four heavy-duty 4" locking swivel casters. The entire unit is finished with clear UV finish.